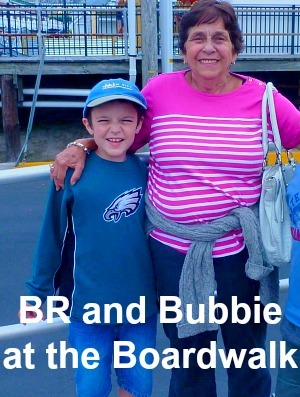 Each year BR spends one week at Bubbie camp. Bubbie, by the way, is the Yiddish word for grandmother and that is what all my mother’s grandchildren call her. This is the 5th year that BR has spent a week with my mother on his own. SJ will have his chance later in the summer. BR’s excitement to get away has remained (thankfully, he sleeps the night before now). And why shouldn’t it? When he is at Bubbie’s, she dotes on him like a good grandmother should. She starts buying and making all his favorite foods weeks in advance, takes him to the pool and other fun places, and invites other relatives to come see him. When I was growing up, my grandmother (we called her nanny) lived nearby (My paternal grandmother passed when I was 11 and had been sickly since before I was born). Even though she lived a short car ride away, I would spend a few days at her apartment with her each summer. Eat it all over again? Twenty minutes later, the eggs and trimmings were back in front of me. Nanny did plenty of other things with me too. She would take me out for pizza, bring me to the swimming pool, go to the movies with me, play Rummikub, etc. I would also go food shopping with Nanny. She always seemed to need groceries particularly tuna fish. I vividly remember her going through the aisles of Shop N’ Bag buying cans of StarKist turn for 59 cents each. On our way back home, we would stop off at the huckster. I don’t know why she called him that. He, Michael was his name, sold fruits and vegetables on the corner of her block. He loved nanny too – she was a good customer. Anyway, I would push the cart and carry some bags. Nanny didn’t drive. My mini-vacations to Nanny’s were about more than eating my favorite foods and going swimming. I got to know her. I learned about what she was like as a child, what it was like for my mother growing up, what she thought about certain things, how she interacted with people and more. Through getting to know her and deepening a special relationship, I also got to know myself. She continues to be in my memories today. My children have a lovely relationship with their Bubbie. Each time they come back home after a week at Bubbie’s, they are changed… for the better. I hope they soak up all she has to offer, and they have a grandmother to dote on them for many years to come. They will be the better for it. Time with Bubbie is well spent and invaluable. That sounds like nothing but a time for them both to create great memories. I agree 100% Jack. I hope those memories will be with my boys for years to come. I love the idea of Bubbie Camp! My kids have been spending one summer day a week with each grandma, and they’re all benefitting from it. The grandmas aren’t as bored and neither are the kids! Glad to hear that it works over there for all parties too. I think spending time with grandparents has so many benefits – plenty of which we don’t see.